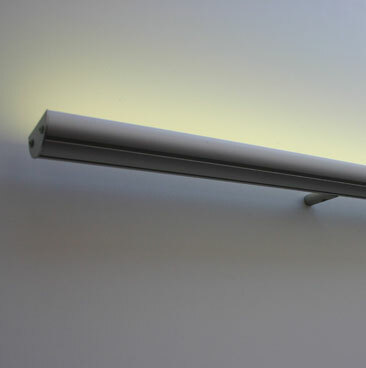 Axxnt is ACL’s modular LED product solution designed for wall or cove mounting. The exposed Axxnt is encased in an elegant clear satin aluminum case with a clear frosted acrylic lens. They are available in 30 and 120 degree beam spreads. LED offers energy saving features and come in a variety of colors. Linked fixtures can conform to short or long sweeping curved architectural features while maintaining even light output. Due to Axxnt’s precise light distribution and even luminance they are an excellent choice for dynamic illumination of interior and exterior structures and architectural applications. Low wattage consumption combined with extended life make Axxnt an economical choice. They are available in a variety of lengths, as well as custom lengths.